Clint Dempsey 10th and 11th goals this season helped his side Fulham beat Bolton 3-0 on Wednesday night. The goals helped Dempsey move past Brian McBride and Steed Malbranque, who both previously scored 32 league goals for Fulham. The American midfielder hooked a half-cleared corner into the net after 15 minutes and tapped in Eidur Gudjohnsen’s flick-on 3 minutes into the second half to take his tally since joining Fulham in 2007 to 33 goals. Fellow Texan Brede Hangeland, a defender who plays his international soccer for Norway, completed Fulham’s victory with a 65th- minute header. The victory extended Fulham’s unbeaten run at Craven Cottage to seven matches, during which they have picked up 19 points out of a possible 21 to banish all thoughts of relegation for another season at least. The three points also allowed Fulham to move into the top half of the Premier League standings to ninth, one spot and four points behind Bolton with four matches remaining. 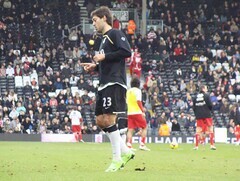 After the game Dempsey believes the only way For Fulham is up.